Without a doubt, menopause is a difficult life phase for most women as their bodies and minds undergo rapid and unfamiliar changes. Here at Menopause Now, we would like to be your companion on this journey by offering you reliable information and practical guidance every step of the way. Let us walk you through this time of changes so that you can pass through it feeling stronger and more empowered. Menopause is an inevitable phase in every woman’s life as her reproductive years come to an end. It is defined as the time when a woman has gone without a period for 12 months in a row. It occurs due to a gradual decline in reproductive hormones, estrogen and progesterone, because of natural aging. Menopause can also be induced through surgery, like hysterectomy, or certain medications. The average age of menopause is 51. Perimenopause, which can last from 2 to 10 years, is when most intense menopause symptoms occur, including irregular periods, hot flashes, and night sweats. A year after the last period, a woman is referred to as postmenopausal. Postmenopausal women should be cautious of complications such as heart disease and osteoporosis. Women are generally encouraged to approach entering the menopausal transition the most natural and least invasive way. Menopause happens as a result of a decline of hormones due to natural aging. As women age, the supply of their ovarian eggs, which are the main producers of key reproductive hormones, estrogen and progesteron, gradually decreases until it reaches total depletion. With no eggs being released, no hormonal production, and no periods occurring for 12 consecutive months, a woman is said to have entered natural menopause. When menopause happens as a result of a surgery or a medical treatment, it is referred to as an induced menopause. Surgical menopause occurs after removing both ovaries (bilateral oophorectomy), causing immediate, abrupt hormonal changes. This procedure is often performed along with hysterectomy, which is the removal of the uterus. Medical menopause occurs when medications or therapies for cancer or other conditions cause damage to the ovaries or ovarian eggs, compromising their function. The most common causes of medical menopause include: radiation therapy, chemotherapy, and other medications. The symptoms typically lessen in postmenopause; however, consistently low hormone levels put women at a of developing heart problems, vaginal athrophy, or osteoporosis. The appearance of the symptoms is often enough to diagnose menopause. However, doctors might search for more tangible signs of menopause through a number of diagnostic tests. Test results showing abnormal levels of follicle-stimulating hormone (FSH) or estradiol indicate menopause. Other tests can be done to rule out thyroid disease as many of its symptoms overlap with those of menopause. Various phytoestrogenic and hormone-balancing herbs have been found to effectively reduce the severity of menopause symptoms. Because of serious health risks involved with menopause medications, their use is typically reserved for the most severe symptoms. 04/18/2019 Many women find themselves sneezing and with nasal congestion and itchy, watery eyes for weeks or months on end, wondering if they will ever find relief from their menopausal allergies. Find out some of the best herbal allergy relief to take control of your health naturally and effectively today. 04/15/2019 Some women who suffer from sudden changes in mood on a consistent basis may not realize the condition at fault for these unexpected, emotional alternations is known as manic depression. 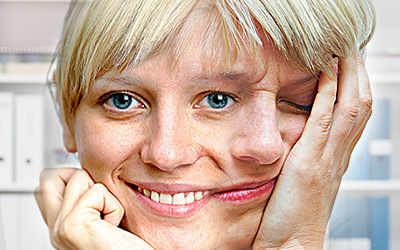 Read all about manic depression here, including what it is, its causes, and how it can be treated. 04/12/2019 Sudden flare-ups of joint pain and inflammation can leave menopausal women distressed and aching throughout their days, wondering when relief will ever come. Click here to learn about the causes of joint inflammation as well as management and treatment options so that you can go back to moving pain-free. Headache in Back of Head: What's Going On? 04/09/2019 Pain from headaches can be concentrated in any area of the head; however, women may wonder why theirs always occurs in the back of the head and if it's a cause for concern. 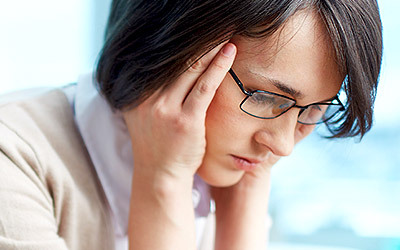 Click here for all about headaches in the back of the head, including management and treatment options.